As well as any other casino game, roulette has its own gambling terms which are necessary to know if you want to take part in this game of luck. We are glad to introduce you the list of the main terms you should learn and remember in order not to be confused while sitting at roulette table. Ball- a small plastic ball which is spun by a croupier and which determines the winning bet when stops at some wheel's pocket. Biased numbers - the numbers which appear very often thanks to a biased wheel. Biased wheel - a kind of a roulette wheel which is constructed in such a way that particular numbers appear more often than they are possible to appear. Black action - a bet of $100 made by one roulette chip. 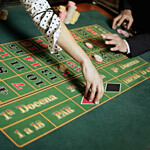 Casino Edge - a house advantage every casino has in roulette casino game. Column Bet - a bet one 1 of 3 columns of a roulette table layout. (1-12, 13-24, 25-36). Corner Bet - a bet on 4 numbers made by placing a chip at the middle of them. Croupier - a French word for a casino dealer. Double-Zero Wheel - a roulette wheel used for American Roulette: it has 2 sectors of zeros - 0 and 00. Dozen Bet - a bet made on any of 3 dozens of a roulette wheel. Even Number Bet - a bet on any even number of roulette wheel (2, 4, 6 etc.) 0 and 00 are not counted to be even numbers! Five-Number Bet - used in American Roulette usually: a player bets on 0-00-1-2-3 at once. Flat Bettor - a roulette playerwho bets the same amount of money every time. 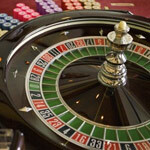 High-Low Bet - a bet on whether on bottom 18 numbers of roulette table (1-18) or top 18 numbers of this table (19-36). Inside Bet - a bet on a number or a group of numbers made within a roulette table layout. Layout - a roulette table which shows all possible bets visible for players and comfortable to bet on. Line Bet - a bet on any two rows of 6 numbers. Non-Value Chip - a chip which costs a table minimum bet. Outside Bet - a bet on any position outside of numbered table layout (red-black, high-low, odd-even). Pay Out - the winning of a player. Red-Black Bet - a bet on whether black or red pocket of a roulette wheel, but not a concrete number. Single-Zero Wheel - used for European Roulette; it has only one zero section. Spin - a roulette play itself: starts when a dealer spins the wheel and ends when the wheel and a ball stop. Split Bet - a bet on 2 numbers at once. Straight Bet - a bet on one particular number which is paid as 35 to 1. Street Bet - a bet on any 3 numbers in a row. 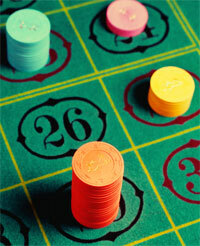 Wheel Chips - the same with roulette chips (special chips which are used particularly for roulette game). Zero - a green number on a roulette wheel surface. American Roulette has two such sectors (0 and 00) and European Roulette has one zero sector.